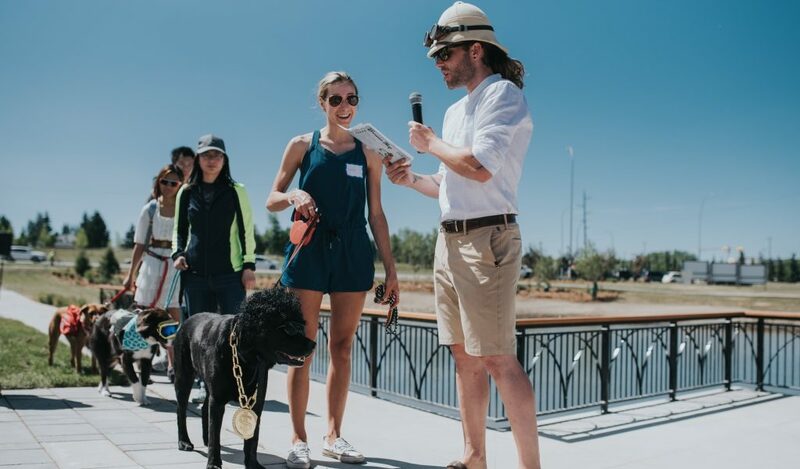 Excited and ready to play, pups of all ages and breeds alongside owners and dog lovers, celebrated last month’s Tails & Treasures event to explore our new North Pond park. Why is this so exciting? The spectacular two-acre multi-purpose park space also features a fenced, off-leash dog park for frolicking free in an urban setting. 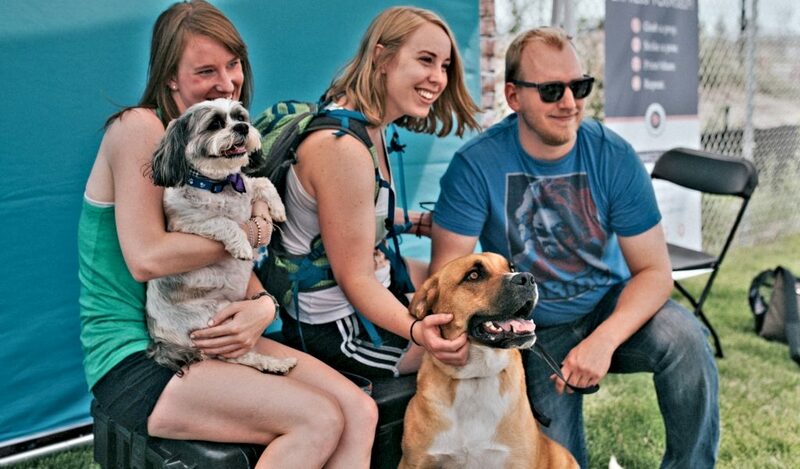 The ultimate playdate was buzzing and barking with happy dogs, owners and friends basking in the Calgary summer sun. Partner that with music by local artist Jory Kinjo and his 3-piece band who set the stage for the perfect Sunday afternoon party. Did you miss out on Tails & Treasures? Enjoy our gallery below to see the Sunday fun day unfold with pictures by local photographer and DJ extraordinaire Leigh-Anne Hazard. Coffee and drink station from Heritage Coffee Roasting Co.
With a $500 prize pack on the line from Fairplay Pet Supply, a surge of participants submitted their treasure map, looking to surprise their pet with a fantastic round up of goodies. As the first hour passed, more and more joined the fun as dogs made new friends and brought their owners along for the ride. Stopping along the path for some friendly hello’s, racing at the speed of light in the off-leash area, and hanging out by the water station to cool off and pant a little – the dogs made this playground their own. The day progressed and community was no longer a concept or part of the masterplan for University District – the event embodied the meaning of community through and through. Future residents, neighbours and Calgarians came together and enjoyed socializing in the park, sitting and chatting, or enjoying popsicles with family and new-found friends in the off-leash area. Want to discover other Northwest off-leash parks? Here is a round up of our top five: Paws and Play: Your Guide to the Best Dog Parks in NW Calgary. Building connections at University District is key, and dogs truly do it best. The peak of the event — a pageant fit for a king or queen — showcased the top dogs and drew excited crowds. From biggest dog to cutest, best dressed to best trick performance, the dogs delighted as each walked the stage as the crowd brought paws and applause to cheer them on. Not only were the pups (and owners) vying for the title, but a fantastic prize pack from AtomicDog Boutique, one of the many sponsors for Tails & Treasures. The event wound down, with many guests and dogs staying to play or chat with the local business owners. We enjoyed a cold brew (the coffee kind) to cool down from the summer heat and it looked like a good time for an afternoon nap for our four-legged friends. 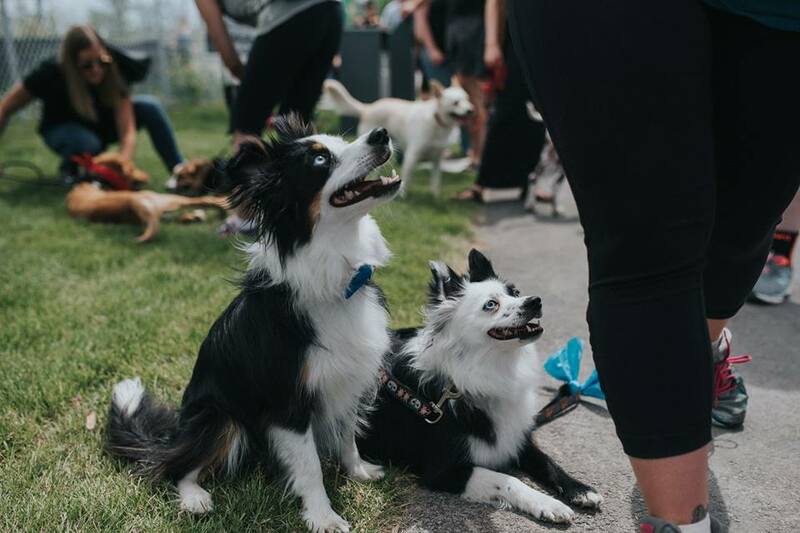 Whether you came for the neighbourly connections, the off-leash haven, the fantastic music or the sweet treats, Tails & Treasures brought the community together on a whole other pet-friendly level. Beyond the one-day event, the park is recognized as another local destination that is simply a great gathering place. If you’re a homebuyer, the day presented an opportunity to envision life in urban Calgary for its upbeat vibrancy. Learn more about the future of open spaces and parks at University District. Click here and read about the South Pond, our next development. To wrap up our doggone celebrations, a Pupparazzi contest that was held from July 1 to July 31 showcased the top dogs of social media using #UDCalgaryTails. 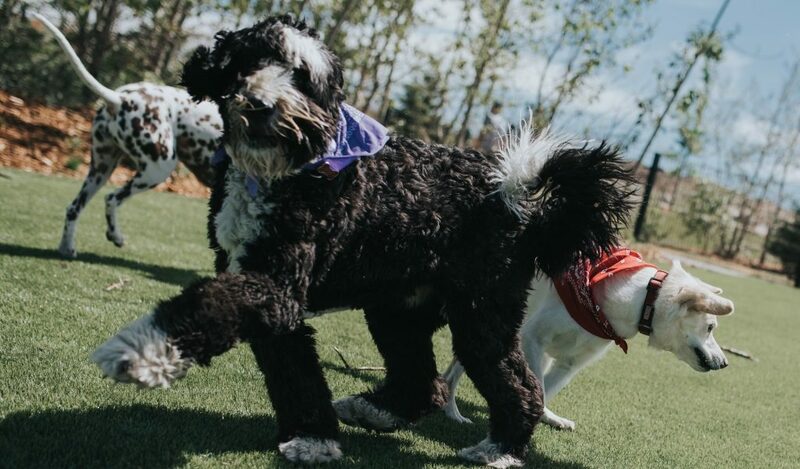 From the dressed up to the fluffed up, many of the pictured pups used the new park as their Instagrammable backdrop, and definitely proved that Calgary is very much a dog’s haven. Our winner, announced on August 4, received a $300 prize pack from Doodle Dogs alongside some well-deserved social media attention. Short-haired to shaggy, tiny to mighty, frisky to fetching – all the dogs that came out to play made it an event to remember. The local businesses that participated in the epic Sunday made it an enjoyable affair, especially prize sponsors AtomicDog Boutique, Fairplay Pet Supply, and Doodle Dogs. What are our residents saying about the new park? “We’re one of the first residents moving into University District late August, into the Ivy by Brookfield Residential, and we didn’t realize that the park would be opened by the time we moved in! We’ve been on the fence for years about getting a puppy, and the fact that University District has a off-leash dog park so close to us might be the excuse we’ve been looking for. Want to stay up-to-date on our upcoming events and contests? Sign up for our newsletter.